Our patient profile this month is Kirk, who I have been following for a number of years. Over that time, he had always been quite heavy. He was diabetic on several medications and developing all the usual insults of obesity and diabetes. We had started to develop our Intensive Dietary Management Program several years ago because it became clear that treating patients like Kirk with medication was not helpful. He was on medication for diabetes, medication for blood pressure, medication for kidney disease etc. Yet, despite all this medication, he was not getting any healthier. Actually, to the contrary, he was getting sicker. This is for the simple reason that underlying his metabolic syndrome was the excess insulin that was causing it. Without treating the root cause of the metabolic syndrome, he had no chance of cure. As with most people, Kirk had tried all kinds of diets. There were good ones and bad ones. In the end, they all did not work. Finally, in desperation, he was about to undergo gastric bypass surgery. This is popularly known as ‘stomach stapling’. In essence, the stomach is cut to the size of a walnut. As if that is not enough, the intestines are rewired so that any food that does make it through the stomach does not get absorbed into the body. While it is highly invasive and has many surgical side effects, the bottom line is that this surgery is actually quite successful in causing weight loss. Essentially, this stomach stapling is a form of surgically enforced fasting. If fasting is what makes the surgery successful, why would you not do the fasting and skip the surgery? That would be much more preferable. People always assume that they cannot fast for a prolonged period of time despite having never tried it in the first place. The other oddity I have alway found is this. If I recommend that a patient fast for a week or more, other health professionals think I’m crazy. If instead, I recommend that a patient has major invasive surgery to remove healthy stomach and change an normal intestinal tract into an abnormal one, all so that he can fast, then I’m a good doctor. Crazy. So I had a long discussion with Kirk and his wife. The IDM program was just being launced and we enrolled Kirk as one of our first patients. 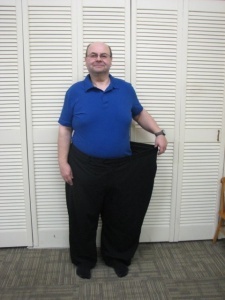 If it did not work, he would always have the option of going for the bariatric surgery. There was no downside risk. Over the past 18 months, Kirk has done amazingly well. His weight is down. His diabetes is almost completely reversed. He is able to walk better. He has more energy. He looks like an entirely new man. Congratulations Kirk. Below, he’s written his story in his own words. Kirk: I have been overweight since 3rd grade. Having tried numerous diets and methods of losing weight, I became desperate for a solution and received approval for gastric bypass surgery. During a regular visit to Dr. Fung I mentioned this and he asked if I would be interested in taking part in a new dietary management program he was starting.I feel very blessed that this happened because I was totally put off the gastric bypass surgery after attending an information session at Toronto Western. I began the Intensive Dietary Management program in June of 2013 and with the help & encouragement of Dr.Fung, Megan and my family (especially my daughter Catherine whom we call the food police) I have achieved fantastic results. 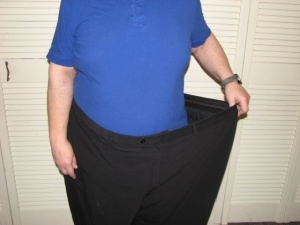 In the past eighteen months I have seen my weight reduced from 360 lb. to 244 lbs.Yes that’s a 116 lbs. or the equivalent of a small adult. 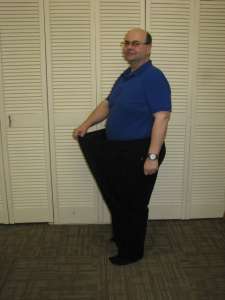 My waist size decreased substantially from a starting point of 63 inches and now is 48 inches, a reduction of 15 inches! Most amazing of all is the reduction in prescription drugs. Before the program I was taking 9 pills a day, 3 types of which were to help control my diabetes and one for high blood pressure. Today I take only 2 pills a day, one of which is for diabetes control. My A1C level is now better controlled, although my insulin resistance is still an issue. I have more energy, increased mobility and look forward to continuing in the program. The monthly group sessions are enjoyable and a good source of information. I do not have any before and after pictures but have include some of me wearing the same pants I wore on the first day I started the program. I was low fat vegan for 2 years (gave it a good try) in order to reverse my diabetes and lost no weight, and was unsuccessful in reversing the diabetes. I realize that I am only a community of one, excuse me, two, as my husband, also diabetic, joined me. I wish you would do a profile on a woman who has been successful with your program. I have only ever seen men. Does it not work for women as well? In our clinic, we have close to 50% women, and it seems to work equally well. Dear Sir., its nice i came across this website. i am follwoing your utube videos also., and am very happy. thi is a source of inspiration and guidance for people like me sufferng from diabetes. I wish you all the best in your endeavurs. I just had a question about the program. When you go on a fasting day do you stop all insulin even your background insulin? I’m interested to know more about the IDM programme. Where can I get more information or how do I go about it? Thank you. I am puzzled by the fasting part of the program. Looking up “intermittent fasting” on the web, I am intrigued by the schedule of 16 hours fasting and 8 hours eating healthily each day. Will that schedule work with your program or must the fasting be for even longer periods? Thank you. There are many different schedules of IF. There is a daily 16 hour fast, a daily 20 hour fast, a 24hr a 36 hour, or even a week fast. They can all be made to work. I have the informal Roger schedule, the non-schedule. Once per day, utterly small meal once per day, 12 noon and 6 pm schedule, skip an entire day schedule. I don’t follow rules too well, only principles.